Not to mention a slight boost in mpg. Injectors plus the ’89 or 90 ECU in an ’87 Renix Cherokee equals one smooth running vehicle. So does an 88 or later TCU. What mileage have you gotten on a highway trip with those mods? Just got back from a 300 mile trip and averaged 20.6 mpg. Went through a quart of oil though haha. With a little tail wind on the Hwy, I logged 24 MPG once, in my 90 with over 280K, and packen over 500 Lbs. of tools and stuff. Thanks for the mention. Actually I stumbled upon the 746’s based on someone suggesting the Volvo 702’s as an alternative to the Neon 703’s for mid-90’s XJs. This was based on a mis-print on the Bosch data sheet which shows the 702s and 703s being identical. In reality the 702 is just another version of the 746. That being said I first learned about injectors from Rainman who posts regularly on an Aussie XJ forum. Well, thanks for your contribution. I’ve used other 4 hole Bosch injectors before. Traded them out for the 746s, and there is a noticeable difference. Not really. 746s are the proven best. Negative on the 703. I tried them in my 89 with the snap on scanner hooked up and it went into closed loop for a minute. Then slowly the fuel trim went down to 0 from 128 and default to open loop. Thing is, it ran great and couldnt tell it was in openloop save for the scan tool. I was due for a smog check that week so I’m glad I bought the snap on when I did. Do you still have 746’s available? I don’t sell them but they can be had on ebay. I got a set of 746 today. Was noticing the 4 tiny pin point size spray holes on the bosch, looking at the factory 1 hole 90 renix injectors it seams like the 1 hole would put out at least 25% more volume than the 746. Also what is with the small plastic hat or cap on the end of the bosch 746. I have an ’87 with 89 computers. tried the 703’s and they were too much so went to the 746’s. It runs great; starts, idles, pulls better but the MPG seems to have gone down the tube. I am not sure where to start checking. I did not remember the procedure for resetting the computer. Any help is welcome because my hopes were up and are now are rather deflated. “Seems to have gone down” isn’t a scientific conclusion. You need to do the calculations based on miles traveled divided by gallons used based on a full tank. Drive it for a while. You’re not getting heavy on the skinny pedal now that it’s more responsive, are you? You are right. I should have been more explicit. I will do those things. It is typically driven to town, 50 miles each way, about every three weeks or so. The last trip the gauge went from just over 3/4 to just under 1/4, but sill not very scientific. Tips 33 – 35 and 38 – 39 seem to be dead links on the index page. That’s because I haven’t done those write-ups yet. First off, thanks for all the tips. My coworker and I both own MJ’s and we refer to your word as gospel. I just installed the 746’s in my 92′ Comanche Elim. Reason being, the Renix and HO both come with the same stock fuel injectors, so I figured why not try it out. The install went fine, and when it’s running it feels smoother and there is less noise coming from the engine. Power feels the same. Haven’t tested for mpg. Only one issue: When I crank the motor is needs help turning over with a little tap on the gas pedal. I haven’t heard of anyone else having to do this. if I don’t tap the pedal, half the time it will start. I’m gonna recheck all my vacuums and such, but what’s your opinion on why this is happening? Maybe the 4-port injectors aren’t properly cleaned? Or the HO needs more juice? I’m not sure. I would double check things around the installation process. Vacuum lines and such. I’ve never used 746s in the later application, but I certainly see your logic. Great work in developing these helpful, correct, and welcome Renix Jeep upgrades, Cruiser54. The tips on sensor tests and ground improvements worked quite well for me. Installing the dual-diaphragm brake booster upgrade has paid back in performance and safety. But my vote for “best tip” has to be: 4-port fuel injectors! For 86-90 Renix Jeeps you nixed the 703 fuel injectors and confirmed 746 injectors: I heartily agree. My ’89 Wagoneer had developed one leaky injector, so I hunted a full replacement set. Another website had rec’d 703’s (nowhere stating the properly applicable year Jeeps), but with them my engine ran black-smoke rich and its ECU refused to learn to adjust for them. I resold the 703s on eBay, and then luckily found your website. I followed your recommendation to install 746 injectors. Mamma mia! Now the Wagoneer idles and runs more smoothly than I’ve ever experienced. In a week or so I’ll have two 150-mile highway trips for MPG data to post here, too. Thanks! Keep us in the loop. I’m pleased to hear of your successes. Enjoy your Renix Jeep!!! January 30, 2018: in 400 miles of mixed speed-and-terrain highway travel, mostly 65 MPH, it averaged a familiar 20 MPG. So no MPG increase, but heck, the nice idle, smoother power curve, and quieter engine with the 746 injectors makes it a winner. Thanks for the update. Very typical result. Hi. Firstoffall sorry for bad english. I did the injector upgrade to my -88 4.0 renix, i buyed the 746 injectors, and installed them. But there is some issues, iddle is 1000rmp on D when car is stop, and car shakes litlebitt. On driving it feels like some power is missing. I just cleaned the throttlebody and adjusted tps. With the original injectors it worked fine, and there was huge different after adjusting tps and cleaned throttlebody. Could it be like too low fuelpressure, or what could it be? Thaks beforehand! Did your injectors come with new o-rings? I would suspect you have a leaky one or two. easy to check. With the engine running, spray some carb cleaner around each injector. If there’s a vacuum leak there, you will notice an immediate change in engine rPM. Yes they came with new o-rings. I l try that carb cleaner tomorrow, and report back, if there was some leaks. Thanks for the tip! Did you use any oil on the o-rings before installation? Yes, i used some basic vaselin to help them go on place. Please inspect the hose/tube from your throttle body to the MAP sensor on the firewall. It may have been damaged during the injector installation. Ok, i think i do “tip31” just to be sure in this case. Thanks for the advices! Hi again. So, i did test with startpilot spray to injectors, no leaks. And that mapsensor tube, is ok also. I measured fuelpressure, and it was 2bar when idlle, if reved it dropped to 1-1,5bar and raised to 2bar when idle. I tryed to raise pressure to 3bar, but no change. Feels still heavy to drive, like power is missing. And i just changed fuelfilter, so thats new. can you translate the fuel pressure figures from bar to PSI? A bit late but i just found your wonderful website (’87 XJ with 305K – I’ve done only the last 3-4K). 1 Bar = 14.7PSI , so he is saying that he essentially has 30PSI at idle and 15-22 when revved. Either the fuel pump is weak, or the internal hose from the pump to tank outlet is deteriorated from using ethanol fuels. Woulda been a long time ago if Mopar hadn’t discontinued the windblocker parts. In the meantime, make sure the weatherstrips on the A pillar are sealed from top to bottom. The gaps between those plastic rivets creates wind noise. As I’m moving my project along on the MJ the next thing on my list is a complete tune-up to include plugs, wires, distributor cap/button and injector replacement. Sounds like everyone is pleased and had good results with the Boschs. I’ve looked on EBay and there are quite a few people selling them, any recommendations on seller(s) would be appreciated if you have one. There are Jeep community members supplying injectors. jhc7399 on Cherokee Forum and Neil at http://www.meanlemons.com. Found them over at the Cherokee forum. I’ll be ordering shortly. Great. always best to support the community!! Completed the 746 swap today, much better idle and appears to have a little more pep but the verdict is still out. Other than some missing parts on the fuel rail that the PO failed to mention to me I’m satisfied and consider it money well spent. It’s a nice upgrade. Where did you get the injectors? Over off the Cherokee forum, jhc7399, you mentioned his name on some earlier correspondence. Fast shipping and smooth transaction. So get a load of this, the PO evidently swapped out one of the injectors, one of them was basically new, during the installation I found one of the bracket bolts missing that holds the rail in place and the retaining clip that holds the gas line in place on the fuel railing missing. The gas line tubing was just shoved up into it, I’m surprised the pressure in the fuel rail didn’t blow it out. Dodged a bullet on that one, had to order one and won’t be driving it until that is definitely fixed. Just installed these and it’s like I have a new Comanche. Working my way thought all of these and loving the difference it makes. Cruiser you are awesome from a current Mopar service manager. Thank you for this sure it is amazing. Was looking through the comments and didn’t see it asked, but am I guessing correctly that this wouldn’t work for us 2.5 TBI folks? If not, are there any options for injector upgrade/refresh? Thanks. Have you refreshed the firewall to head ground yet? Yes, I’ve completed tips 1-3, installed a new 02 sensor, upgraded to an aluminum value cover, and replaced the battery cables with a MeanLemons kit. scrape the firewall mounting point to bare metal? You might have gotten some bad ones. Return them and get some 746s. To clarify my post from 9,7,18: I just ordered part# 0280155703 injectors on 9,7,18 because that was the part# I came up with, so is that right and will they work? The ones currently installed (probaly original) are the ones that are leaking. Side question, how do I disconnect the fuel pressure regulator from the hard fuel line? Push the two sides of the plastic connector and pull? I just want to make sure I’m doing it right so I don’t break anything. Give them a call and verify what they are offering. Any advice on how to locate injector connectors that are compatible with the bosch 749 injectors and the 1990 renix? 746 injectors plug right into the stock connectors. I need to replace my connectors because the wire coating are cracked and hard. So I need one that fit the 746 injectors. And thanks for the replies. My research shows aftermarket injector connectors with pig tails come with 2 white wires. The factory 90 xj connector wires are black and green. Does it matter which way the connector is wired in? Correct on the fuel pressure regulator. Sure hope those two quick connects can be reused ’cause I can’t find them anywhere, even tried the dealership and what size are they 3-8 or 5-16? The injectors are #710s (ford I beleive) not #703s, that was confusion on my part. Sorry about that. Thanks for the input, it’s appreciated. 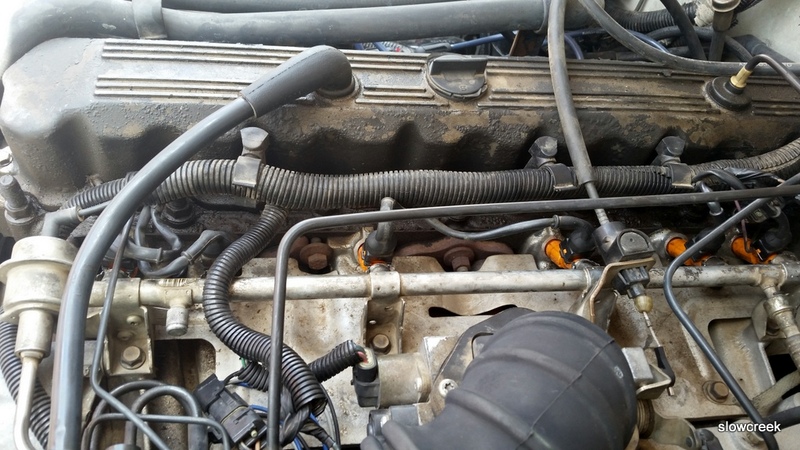 I was just wondering which injectors are the stock ones for the xj 88,cause mine’s have two classes of them, have four 53030262 and 2 4554130,and let me tell you this thing consumes big fuel and puke to much black smoke, so tired about it! I honestly don’t know off hand. Perhaps someone can chime in with the numbers off the stock injectors they removed when upgrading. All mine are long gone. I recently changed mine out to the 746s and kept one of them. It’s in my shop someiwhere and I’ll see if I can find it and get a part# for you. I have an 88 MJ but I would think they are the same. Just wondering, you mentioned that you couldn’t get the 746s, I ordered my online and had them shipped to me??? Couldn’t find the injector, thought I had saved one of them but evidently didn’t. I wonder why he can’t get injectors. Any way we could help? Well I replaced the injectors with the Volvo one’s. It does have quicker throttle response and seems to be smoother running down the road. But now at idle it sounds like it has a miss, only at idle though. It almost sounds like its cammed, kind of a lope. Any thoughts? I bet you disturbed the line from throttle body to MAP sensor. The injector connectors for the 746 and stock injectors are the same and are readily available. Randy, it doesn’t matter which wires go where on one injector. Can anyone chim in on what is the small plastic hat or cap on the end of the injectors? Does it get install with the injector? Yep. Lube up the o-rings with oil and install them in the rail first. Make sure you don’t bust the throttle body to MAP line in the process. I replaced my injectors with 746. I then tested the original 90 renix injectors using a 9v battery… but no clicking sound coming from them. Do the factory injectors need tested using a 12v battery? 5 volts should fire them. Maybe they are being fired but are crudded up a bit. Is there an upgrade or improvements from using a ecu from 90-92 XJ on a 87 Xj? 89 and 90 yes. Later than that are incompatible. The 746s work the best. There are some others that will “work”, but I’ve replaced tose with 746s and there is an improvement.